The Jerez de la Frontera region produces, in my opinion, the best Sherry in the world- but don’t take my word for it, go and visit! This is sherry country or “Jerez” as the locals call it. Located deep in the south of southern Spain. Jerez de la Frontera is south of Seville and just east of Cadiz. The area around Jerez is flat with some rolling hills. The countryside is filled with vineyards but the best are centrally located in the city of Jerez. With a population around 200,000 it is the fifth largest city in Andalucia. Jerez even has its own airport making it very convenient to get to especially for flights within Europe. 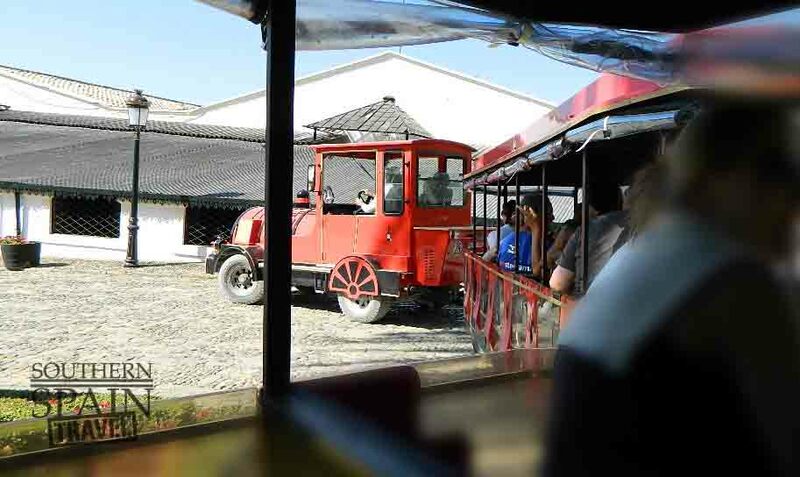 It is also a stop along the rail line connecting Cadiz and Seville. I highly recommend taking the train to Jerez if you are not flying directly there. The train is cheap, clean, and comfortable get on or connect at Seville’s Santa Justa train station and get off at Jerez. Jerez de la Frontera named so because it was the frontier between the muslim and Christian rulers. While it has been centuries since they have been a frontier, the name stuck. While wine is their main source of business Jerez de la Frontera is also known for its horsemanship and has begun to expand in tourism. Home to the Andalusian Centre of Flamenco, its Holy Week, and Horse Fair in May it attracts tourists from all over the world. Alcazar - Origninally built in 11th century this moorish palace had a moat that has long since been filled in. After the Christian reconquest it became home to the local Christian mayors. Today it is a tourist attraction with a pretty garden, mosque, tower, and arab baths. Worth a quick look especially to see the Camara Oscura located in the tower. Camara Oscura - Well worth the visit to the Alcazar to finish off the visit with this panoramic visualization of the city. The Camara Oscura gives a 3 dimensional picture of the city. Hammam Andalucia Arrab Baths - Great place to relax after a day of drinking and sightseeing. Experience the hot, cold, and medium waters of Arab baths. 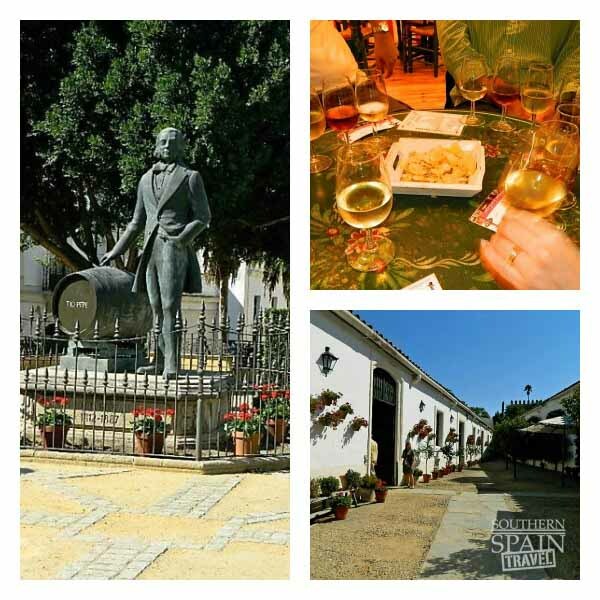 González Byass - Maker of the famous Tio Pepe sherry gives a relaxing 1.5 hour tour where you get to learn about the Sherry making process. It is no longer produced on site as they have a huge facility outside of town for their everyday production. The grounds are pretty, with a little vineyard, and a cask of wine barrels signed by famous people from across the world. Sample some sherry and light tapas at the end of the tour. Careful, sherry is much stronger than normal wine. Lustau Winery - Started in 1896 by Don José Ruiz-Berdejo and later expanded by his son-in-law Don Emilio Lustau Ortega . Lustau continued to grow and under the management of Rafael Balao the company started concentrating on quality. Lustau winery offers tours Monday through Friday 9:30 a.m. to 6:00 p.m.
Jerez de la Frontera Cathedral - Located on the grounds of what used to be a mosque. Take note of the churches nice doorways when you enter with the immaculate conception in the center. The building was a Collegiate church unitl 1980 when the pope made it a cathedral and Jerez a diocese. Inside the church huge colums rise to the ceiling like giant sequoia trees in a forest. The main alter is not as ornate as others you will find across Spain but it works well here. 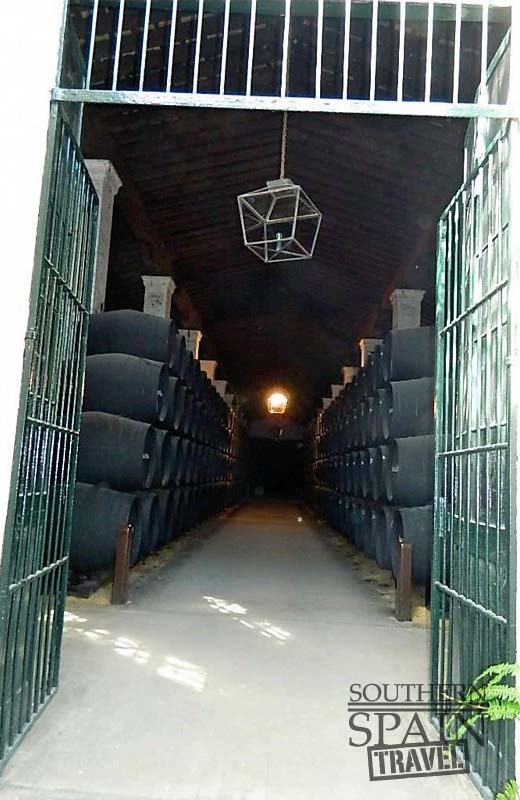 Sandeman Bodega - Got its start in 1790’s in London by a Scottman who started trading in wine and eventually established himself in Cadiz. Sandeman was one of the first companies to trademark their barnd in 1877. Today the Sandemans are still family owned and welcome quest to tour the bodega. Its tour goes through the sherry making process and you get to tour the bottling facility. Two wine samples at the end of the tour. Harvey Bodega - Started in 1796 in Bristol, England and best known for the Harvey’s Bristol Cream a blend of 50 different soleras. it too offers a wine tour that goes through the sherry making process and allows you samples at the end. This cute little restaurant on a side street in Jerez puts a new spin traditional Spanish plates. It has a cute atmosphere with trendy dishes and a romantic atmosphere. Cruz Blanca is extremely popular with the locals with is excellent traditional Spanish dishes. The outside patio provides a relaxing atmosphere in which to enjoy your meal. Meson del Asador is a meat lovers paradise but they do have other options. Located on a smaller side street so it might take some looking to find but worth the effort.